Hello friends!! Hope your week is off to a good start. I got to have lunch today (Monday) with a dear friend and it was lovely! Have a little card to post today for a couple of challenges: CAS(E) this Sketch and Simon Says Stamp Wednesday challenge. A week or so ago I made the pineapple using my Concord & 9th Pop Art Pineapples set, but never ended up using it. It was just sitting there waiting for me to do something with it. So I sprayed it with some of the Prima Pearl White Color Bloom and let it dry. Following the sketch from CTS I added a little nest of silver thread and then layered the pineapple on top. I die cut the banner (from the Pop Art Pineapples die set) stamped it with the sentiment and layered it on top. Adhered the panel to a light grey cardstock base. Once that was done I decided to add a bit more shimmer to the pineapple because the shimmer provided by the color bloom is rather subtle. I grabbed by Diamond Stickles and added some to the pineapple top. 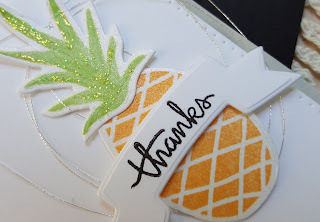 I was able to get a close up shot of the pineapple so you can see the pretty shimmer. Super simple card, but that's what I like!! A classic & wonderful Rosemary creation--love this, my friend! The Stickles provides such a beautiful touch! Glad you had fun for lunch--nice to be able to meet a friend! Hope it's you & me one of these days! 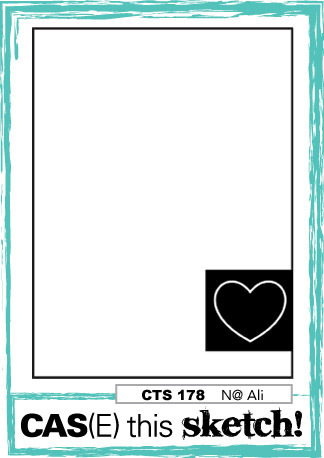 love this CAS card :) thank you for playing along with us at simon says stamp wednesday challenge! Perfect CAS card and the shimmer looks fabulous in the photo, so it must look amazing IRL. 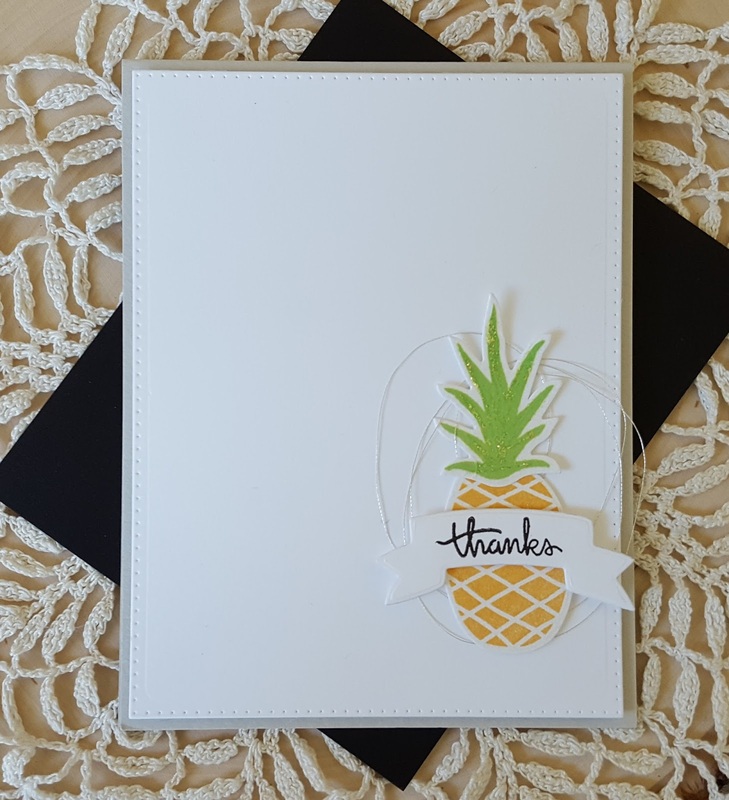 Stunning CAS card Rosie, love the pineapple! Oh, WOW, your pineapple looks great, Rosemary!!! What a wonderful CAS card!!! Love the thread to add just that little something to make really lovely!!!! What a wonderful take on the CTS sketch!!!!! Oh, I love this! Fabulous take on the sketch! Love it! It's just perfect and CAS! thanks for a great year..